The e-mail was from papa. Well, not really. But that's how his many DIY fans refer to Nelson Pass on the DIYAudio forum. The thread on how to build a FirstWatt F5 from scratch has developed into 174 colossal pages by now. Which segues smoothly into today's note. In his typically terse e-mail, the man had indicated that the last of the F5s were trundling out of his kitchen workshop and that a new product was nearing completion. 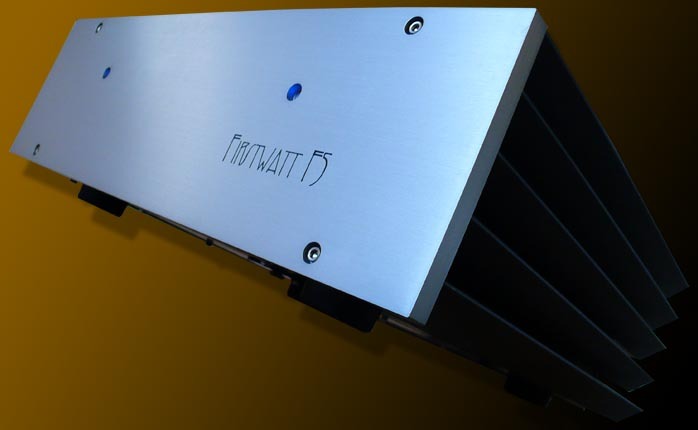 If you don't know Nelson's MO for FirstWatt, output there is deliberately limited to 100 units per model. It prevents boredom -- he makes everything himself -- and allows his creativity an outlet for new circuits faster and more regularly than PassLabs could support. I can't be absolutely sure but it seems that sell-through of the F1 took about 2 years. The F5 meanwhile appears to be nearing expiry a lot sooner. If so, more folks glommed on to it more quickly. This matters nothing to DIYers. With the help of the published circuit schematic and tons of helpful forum posts including replies and tips by the maestro himself, they could roll themselves an F5 twenty years from now. It's us mere mortals without soldering skills or wills who'll be sorry. Let me first interject the obvious. Reviewers aren't sales men even though we occasionally might sound like one when a discovery has us go ape. Shaking excitement duly back to regular and not fevered, I'll merely say that, having reviewed every F-model amp from 1 thru 5, I appreciate why the F5 should have inspired the apparently biggest following. Let me put it this way. I've been an unapologetic SET fancier for a long time. I own a bundle of triode amps and routinely requisition them for review. I know their strengths and also their weaknesses. I have acquired speakers which properly coddle them and all is dandy on that planet. Even so, the amp I find myself listening to the most these days -- 45s, 2A3s, 300Bs and 6C33Cs sitting sadly on the sides like harem girls not played with in too long a time -- is the FirstWatt F5. Its 25/50wpc into 8/4 ohms are plenty potent for most deeds. It's so quiet that even the blood-houndiest noise tracker of a transducer, ear on cone, won't tell you whether the amp is on or not. It's so transparent yet organic and non-grainy that I often end up enjoying systems built around it that don't contain a single glowing bit. The sandman cometh? Forget it, he's here. But that's just me. The real reason for this note is that a number of visiting manufacturers clearly responded equally smitten. Franck Tchang of Acoustic System Int. -- mister resonator man to most -- promptly bought one for himself when he heard mine on his Tango R speakers in Casa Chardonne. Franck's resident amplifier reference was a high-power Karan Acoustics Class A tank. Franck tells me that more than one visitor to his studio has wanted to borrow the F5 and our writers Marja & Henk heard it there and walked away equally stunned (their reference amp is a modified Audio Note UK Meishu 300B machine). There have been other visitors to hear mine and more will surely follow. When told that the amp sells for less than $3,000, they usually shake their heads. These aren't newbies but hard-core addicts who've been around the block a few times. So I know I'm not alone thinking that this F5 is a very special beast. It's simply one which I just learned is nearing the end of its turn-key life cycle. Again, DIYers won't and shouldn't care. It's the others -- I dare say the majority of our readers -- who should. It's not an amp you can hear at dealers or see at shows. If you order one from Nelson, he might have one built up to send out the next day or you may have to wait until he can build one to order. In short, you have to know what you want, take a chance or have 'due cause' to feel sure. If this describes you our could, be aware that we're getting to the "last few" (which doesn't mean that future trade-ins couldn't become available). In again typically Nelson fashion, I don't yet know what the next amp will be until I have a review sample on hand. It could be appropriate for similar end users as the F5. Or it could be something else altogether. There's no way of telling.